Ice cream scoops for unique wedding favors are a cute way for newlywed couples to offer their guests the "scoop" on the wedding festivities. This adorable yet practical wedding favor is available in all types of colors, sizes and even shapes. Why an Ice Cream Scoop? An ice cream scoop may seem like an unusual wedding favor, but if properly presented it can be a fun and functional gift for guests. Ice cream scoops are appropriate for many types of weddings, including summer or beach weddings where ice cream will help guests cool off. Couples who met at an ice cream parlor or whose courtship included shared cones and sundaes have sentimental reasons to consider ice cream scoop favors, or any couple who enjoys a sweet treat may find scoops a clever option. A wedding reception that includes a make-your-own sundae bar could also feature scoop favors for a coordinated theme, and some couples may even opt for ice cream wedding cakes as a cool and delicious dessert. Ice cream scoops come in an amazing variety of sizes, shapes, and colors to coordinate with any type of wedding, and how a couple personalizes and presents the favor will also have an impact on its appropriateness. In addition to choosing a type of ice cream scoop to match the formality and tone of the wedding, couples can also personalize the favor for better coordination. How an ice cream scoop is presented is also critical for it to be an attractive favor. Because it is, ultimately, a kitchen utensil, one scoop per couple is sufficient. The scoops may be arranged between assigned place settings, or may be displayed on a centralized table (be sure to request that only one scoop be taken per couple so no guest misses out). If ice cream is available at the reception, the scoops could be given out as guests make sundaes or receive cones. 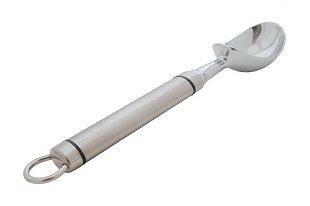 HotRef: Chrome scoop with heart design handle. Elegant Gift Gallery: Blue and white handle ice cream scoop favor, other colors available. My Italian Favors: Stainless steel scoop with crystalline handle. The price for ice cream scoops varies depending on the scoop size, material, and customization, though couples can expect to spend from $2 to $5 or more per scoop. Large quantities can generally be bought in bulk for greater discounts. Couples who want to incorporate an ice cream theme but don't like the idea of ice cream scoops wedding favors have several alternatives that are just as sweet. 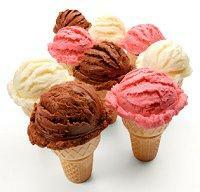 Many candles are available in ice cream scents, such as waffle cone, vanilla, or chocolate. Specialty candles may even be available in ice cream shapes - either just a scoop of the treat, a cone, or as full sundaes with or without coordinating sauce, nuts, and maraschino cherries. Long-handled dessert spoons or small, classic sundae dishes are other alternatives to ice cream scoops. Ice cream is a widely popular treat, and ice cream scoop favors are a great option for couples with a taste for frozen desserts. With many personalization and style options available, scoop favors can match any type of wedding style, from the most casual to the most formal.